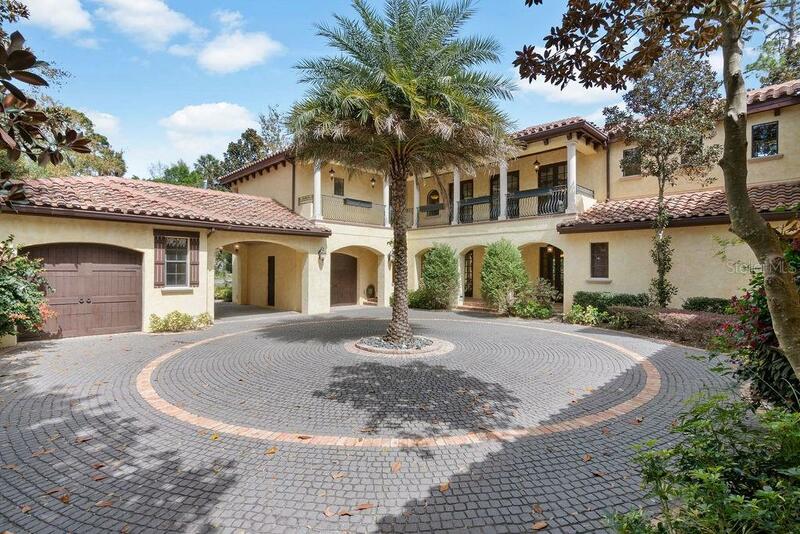 This custom built Tuscan style estate on .71 acre has 6461 sqft of living space and overlooks the 55-acre spring fed lake in the gated community of Lake Forest. Enter this home through its tower entry and custom designed wrought iron double doors. Through the entry you will find the more formal areas of this home: an office/library dining room and living room with a fireplace. A winery in the main hall creates the effect of a wine cellar with its barrel ceiling and wrought iron doors. The first floor also includes the main living spaces: a farmhouse style kitchen with a large granite island gas stove walk-in pantry and breakfast room as well as the family room and the master bedroom suite all with a grand view of the garden and its winding pathways and beautiful setting of the spring-fed lake. Upstairs features a bonus/media room bedroom suite and two additional bedrooms all with custom designed walk-in closets. The wrap around balconies overlook the interior courtyard its cobblestone motor court and garage areas. In addition to the travertine and hardwood floors crown molding and trey ceilings this home showcases its unique finishes such as beams stone floor medallions and mosaic artwork. It is filled with the builderâs exquisite workmanship and attention to detail. Community features include two fishing piers Olympic size and kiddy pools clubhouse fitness room tennis and basketball courts. Located within minutes of shopping restaurants and major highways.